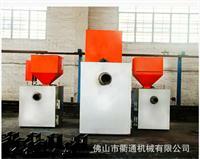 T There are many defects in the direct-burning type burning machine. Such as the fuel burning temperature in the combustion chamber is very high, even higher than of the jet flames. It will make the temperature and the internal pressure of combustion chamber higher and that lead to the life of combustion burner become shorter. Also it would projet out a lot of unburned ashes in the jet flames. Put the biomass fuel in the combustion chamber, then gasifying the biomass fuel with medium temperature, then spew combustible gas and add oxygen to make it burning at high temperature only at the jet flames. This new development has a lot of advantages such as medium temperature in the combustion chamber, low pressure, high temperature flames without ashes and more fuel saving.